Nosso confortável 2 bedroomed rural é ideal para casais e famílias com um casal e um dois (terceira cama disponível) quarto com cama, casa de banho no andar de cima com chuveiro, duche baixo. Cozinha totalmente equipada com máquina de lavar louça, máquina de lavar roupa, frigorífico e microondas. sala de estar de plano aberto grande, sala de jantar com fogão a lenha e sofá-cama que acomoda 2. Portas do pátio para a área do terraço com mobiliário de jardim e jardim traseiro privado. Solar piscina aquecida, que é compartilhada com os proprietários, vários jogos e tênis de mesa. O bar local, a 1 km, vende pão e outros alimentos básicos. Estamos localizados no Canal Nantes-Brest ideal para caminhadas, ciclismo e pesca, as licenças podem ser compradas no bar. Também há o foret de branguilly a apenas 1 km de distância com passeios adoráveis. Até 2 cães bem comportados são bem-vindos. Há um banheiro no andar de cima com mais de banho de chuveiro e WC, no andar térreo há uma sala de banho com WC. Lado de fora: No exterior existe um terraço privado na parte traseira com mobiliário de jardim e um churrasco e grande jardim privado que é cercado e seguro para crianças e cães. Há acesso à piscina aquecida de 5 x 8 m que é compartilhada com os proprietários. O ténis de mesa está localizado na frente da casa. Serviço de limpeza / toalhas / linho / empregada doméstica: Todos os lençóis e toalhas são fornecidos e trocados semanalmente. Fim de deixar a limpeza incluída. A lovely house and garden that was great for the kids as well as a decked area for sitting out and enjoying a BBQ. The kids also loved the pool & inflatables, not to mention the swing ball, table tennis and other games provided. The house is in an ideal location for exploring nearby towns and other activities. The setting is relaxed and peaceful and a great retreat at the end of the day. The owners are on site and happy to give advice and recommendations if you would like them, but equally leave you in peace if not. It was lovely to meet you all and we are happy that you enjoyed your stay. This is a beautiful property with lovely owners. 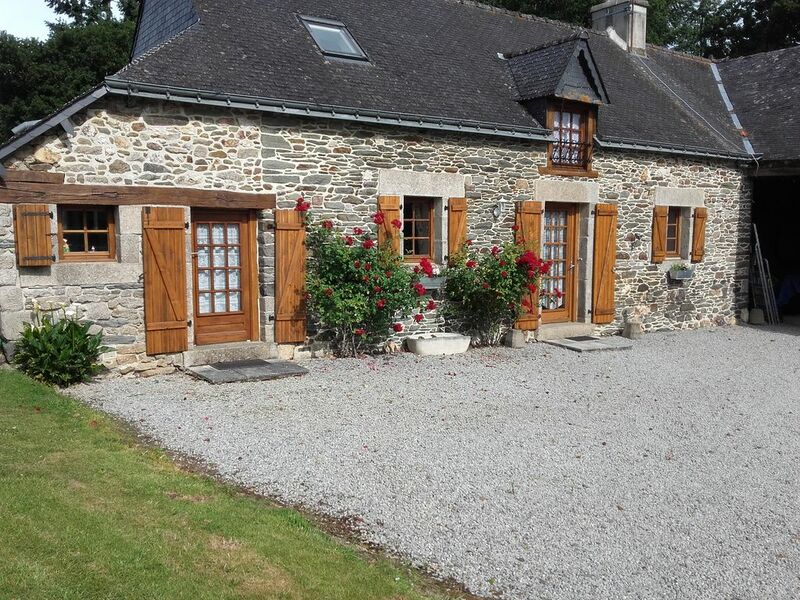 Gite is very comfortable and homely with lots of outdoor space which is lovely and private. Peter and Sharon are excellent hosts and nothing is too much trouble. The gite is one of the best equipped we have stayed in and includes a variety of games for the children to play both indoors and outside. Girls loved the swimming pool and the fact that it was heated was an added bonus, the only drawback is there is nowhere to sit by the pool when the children were swimming and they have to be supervised whilst in the pool. WI-FI is very good (a must with a teenager!) and overall it was a lovely place to stay and relax. Thank you so much for your review, it was a pleasure to meet you all and we are glad you enjoyed your stay. Your comments about the pool seating have been taken on board and we add it to our list for next year. Had an amazing stay here, could not recommend it highly enough and hosts were lovely. Book!! Thank you for your lovely review. It was a pleasure to meet you all. Obwohl die Fotos schon schön sind, werden sie von der Wirklichkeit übertroffen. Unsere Vermieter, eine freundliche und herzliche Familie aus England, haben Herzblut und Geschmack in die Restaurierung des Anwesens gesteckt. Das Ferienhaus ist sehr gut ausgestattet, uns (2 Erwachsene, zwei Kinder 13 und 10) hat nichts gefehlt. Wir haben gegrillt, gekocht (auf Gas - ein Traum) und gebacken, alles ohne Probleme. Die Kinder waren über den Pool begeistert, wir vom großen Garten, den wir zur Alleinbenutzung hatten. Trotz großer Wärme blieb das Haus angenehm kühl. Es gibt kein deutsches Fernsehen, aber das Internet ist stabil , so dass die Kinder sich anderweitig behelfen konnten. Direkt hinter dem Haus fließt der sehr malerische Kanal, dem man bei Touren durch die Bretagne immer wieder begegnet. Wir sind viel gewandert und waren zweimal am Meer, je nach Norden und Süden ist etwa eine Stunde Fahrt einzuplanen. Die Gegend ist wunderschön, Felder, Wäldchen, alte Anwesen und steinerne Kreuze und natürlich Hortensien in allen Farben. We, two oap’s, were looking for somewhere where we could just be still and quiet and have a break from the hustle bustle of everyday life. We found it in spades! We were blessed with total silence day in and day out, and the most wonderful short (or occasional long) walk down to the canal and back via the road.....we didn’t see the kingfishers so will probably have to return another year to experience that pleasure. Thank you for the lovely review. It was a pleasure meeting you. Ideal if you are looking to get away from hustle and bustle and wind right down. The owners are fabulous and couldn't be more helpful. The area is very rural, so perfect for countryside lovers and those looking for a quiet time. The Nantes - Brest Canel is just a 5 minute walk away and gives you cycle access to nearby Rohan for dinner and amenities (5 minutes in the car). If you are feeling more energetic you can cycle further and Pontivy is within reach. The area is very picturesque and Saint Nicolas des Eeau is one lovely place to visit for lunch. The gite and garden are well equipped and the swimming-pool is great for warmer days. Our children made good use of the table-tennis. The Aquatides swimming-pool in Loudeac is a good rainy day destination. Thank-you for a fantastic stay! É cerca de uma hora de carro ao norte e costa sul com lindas praias de areia e restaurantes. O aeroporto mais próximo é o Rennes, que é uma hora de carro, e Dinard Aiport é uma hora e meia de distância e do porto da balsa mais próxima é St Malo horas novamente cerca de 1 e meia de carro. Temos um número de desconto para citar para Brittany Ferries. Rohan é a cidade mais próxima cerca de 5kms com todas as comodidades. Pontivy e Loudeac são cerca de 15kms com os mercados e cidade e semanais. centros com uma boa variedade de lojas. Lac Guerladan oferece esportes aquáticos e praias. PARE DE IMPRENSA. Para todos os fãs de ciclismo que acabamos de ouvir que o tour de france está passando por nossa aldeia em 11 de Julho ea vila está a fazer um dia dele.